A membership site needs a wide customer base. Your topic should be specialized but not so narrow that you can’t attract new members on a consistent basis. Unlike a short report or niche site, your membership site topic has to be large enough that you can produce fresh content month after month. Pick a topic that a lot of people are interested in but that also has the potential for evergreen content. When you start a membership site, your members are looking for a lot of attention and care. Most of this will come in the form of an easy to use site with quality content. But you should also make it a point to be accessible through e-mail or a help desk function. There’s a high level of trust involved in a membership site, so make sure you’re there for your members. Opportunities for backend sales exist in many different places in your membership site. 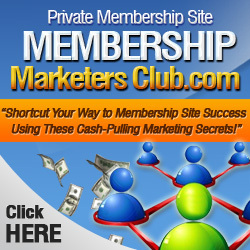 You can sell advertising space within the site or create a platinum level of membership with special coaching. Just because the members are paying a monthly fee doesn’t mean they won’t be willing to pay for extra information on the site’s topic. If you’re concentrating on getting members but aren’t worried about keeping them, you have a recipe for disaster on your hands. It takes much more effort to get a new member than it does to keep one that you’ve already got. By posting consistent content, offering polls, running contests and getting involved the community in your membership site, you’ll be able to hold onto the members you’ve got.